Find a similar product below or contact our experts for a recommendation of great alternatives. Call us at 800-449-9128. A portable combo amp that offers all the great tones a pro could ask for. 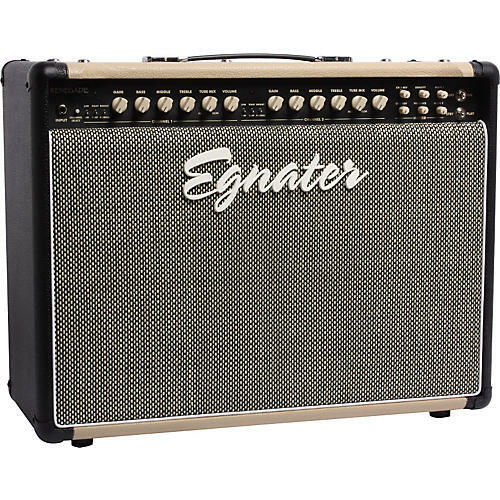 The Egnater Renegade 112 Tube Guitar Combo camp is a versatile 2-channel powerhouse. The 65W 1x12 guitar amp gives you the tools to forge your sound and the power to move some serious air whatever the size of your venue. Channel 1 produces lush, 3-dimensional clean tones with just a bit of grunt when you dig in. Channel 2 starts with a sweet, bluesy overdrive, but pushing the gain opens the floodgates, unleashing enough thick, harmonically rich distortion to satisfy the most demanding player. Both channels offer an independent 3-band EQ, Egnater's BRIGHT and TIGHT switches and a Wattage Selector switch that lets you choose between an intimate 10W or a wall-shaking 65W. Master Presence and Density knobs let you sculpt the high and low-end response. At the heart of this Egnater tone machine, you'll find 5 12AX7 preamp tubes and a power section fueled by 2 6L6s and 2 EL34s. The Renegade Head features the ground-breaking Tube Mix function on each channel, allowing you to blend the deep Californian character of the 6L6s with the aggressive British midrange punch of the EL34 tubes. Independent reverb controls for each channel, dual footswitchable master volumes and a speaker-emulated line out complete the Renegade 112. The included 4-button footswitch controls much more than just channel switching. Use the switch to engage the on-board reverb, effects loop and secondary master volume with channel-assigning switches for all 3. Run them on both channels or just the one you choose. Heavy Duty Cover Included. The Egnater Renegade 112 is loaded with a 12" Egnater Elite-100 Speaker by Celestion. Birch wood gives the heavy-duty cabinet road-worthy ruggedness. Egnater includes a heavy-duty cover wiht the Renegade 112 Tube Combo Amp. Individual Reverb on Each Channel with "Spillover"